1. Does automation replace manual testing? Automation is the integration of testing tools into the test environment in such a manner that the test execution, logging, and comparison of results are done with little human intervention. A testing tool is a software application which helps automate the testing process. But the testing tool is not the complete answer for automation. One of the huge mistakes done in testing automation is automating the wrong things during development. Many testers learn the hard way that everything cannot be automated. The best components to automate are repetitive tasks. So some companies first start with manual testing and then see which tests are the most repetitive ones and only those are then automated. Unstable software: If the software is still under development and undergoing many changes automation testing will not be that effective. Once in a blue moon test scripts: Do not automate test scripts which will be run once in a while. Code and document review: Do not try to automate code and document reviews; they will just cause trouble. The following figure shows what should not be automated. All repetitive tasks which are frequently used should be automated. For instance, regression tests are prime candidates for automation because they're typically executed many times. Smoke, load, and performance tests are other examples of repetitive tasks that are suitable for automation. White box testing can also be automated using various unit testing tools. Code coverage can also be a good candidate for automation. 2. How does load testing work for websites? Websites have software called a web server installed on the server. The user sends a request to the web server and receives a response. So, for instance, when you type www.google.com the web server senses it and sends you the home page as a response. This happens each time you click on a link, do a submit, etc. So if we want to do load testing you need to just multiply these requests and responses "N" times. This is what an automation tool does. 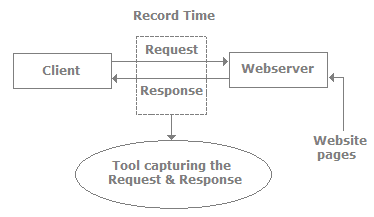 It first captures the request and response and then just multiplies it by "N" times and sends it to the web server, which results in load simulation. 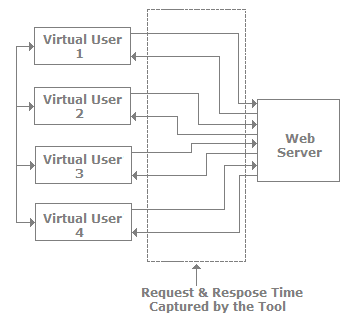 So once the tool captures the request and response, we just need to multiply the request and response with the virtual user. Virtual users are logical users which actually simulate the actual physical user by sending in the same request and response. If you want to do load testing with 10,000 users on an application it's practically impossible. But by using the load testing tool you only need to create 1000 virtual users. 3. Can you explain data-driven testing? Normally an application has to be tested with multiple sets of data. For instance, a simple login screen, depending on the user type, will give different rights. For example, if the user is an admin he will have full rights, while a user will have limited rights and support if he only has read-only support rights. In this scenario the testing steps are the same but with different user ids and passwords. In data-driven testing, inputs to the system are read from data files such as Excel, CSV (comma separated values), ODBC, etc. So the values are read from these sources and then test steps are executed by automated testing.